The guests at this party are queuing to catch razor-toothed, flesh-eating piranha fish. 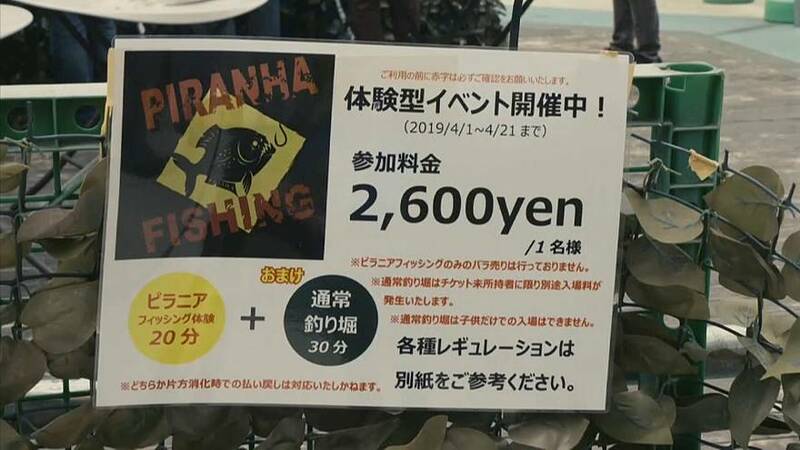 Branded by the organisers as "the most dangerous fishing event" in Japan, it features around 1,000 piranhas flown in from the Amazon River in South America – each in its own individual container. It all started as an April Fool, when people took the organiser's joke about a piranha fishing event seriously. Yano Tomoyuki explained: "I said that I was importing 100,000 piranhas into Japan for a piranha fishing event. I thought it was very obviously a joke. However, some people didn't understand it was a joke and kept calling me asking, where can I buy tickets? Is this a real event? When is it starting?" While the piranhas were not on the menu – they were caught and then returned to the pond – guests sampled exotic meats including kangaroo and crocodile. Tomoyuki said: "The goal of this event was to teach people about the different types of meats from around the world. In Japan, there isn't much to eat besides beef, pork, and chicken. When I was travelling around the world, I tried many different types of meats, so I wanted to create an event where I could share the customs of these different countries." The barbeque was organised to celebrate the end of the Heisei era, ahead of the abdication of Emperor Akihito. When his son Naruhito ascends the throne, the Reiwa era will begin. Naruhito will be the 126th Emperor of Japan.